Follow these tips on how to use a jigsaw (previously known as a 'sabre saw') which is pretty much a motorised coping saw, or hand held scroll saw that cuts with a fast up and down motion using a fairly thin metal blade. The Jigsaw is a really versatile tool that's great for cutting curved shapes in wood or anything else that is normally not straight - when scribing timber to irregular shapes for example. It is also great for cutting things like kitchen worktops for hobs or sinks and for cutting letterboxes in doors. If you work on a building site in the UK then you'll need a 110v model that you use with a 110v transformer or alternatively you can buy battery powered models as well. When should you use a jigsaw to cut timber? For long straight lines a circular saw is better, quicker and neater. For straight short cuts in lengths of timber a miter saw is better. The first jigsaw I bought suffered from 'wandering blades' because it had no guide. The blade would very often try to find the easiest way through the timbers grain instead of cutting where you wanted it to go! Not only that but because these tools are designed to cut on the upward stroke there was a tendency for it to cause 'tear-out' on the face side of the work-piece, splintering the grain upwards and making a bit of a mess of whatever you were trying to cut. The simplest way to avoid this was by turning the timber upside down, marking/setting out and cutting from the back. This isn't always practical, takes longer and increases the margin for error. The final problem it suffered from was burning blades under high loads and when making fast repetitive cuts. Luckily, all these problems have been addressed by the larger manufacturers with anti-splinter inserts, oscillating blade actions, blade guides and downward cutting blades. When choosing yours look for one with adjustable speed settings as well as all the functions listed above. How deep can you cut with a Jigsaw? The depth of cut you can make with a Jigsaw will depend on the length of your blade. With the blade in the tool (and the tool unplugged/without a battery), push the blade as far up into the body as possible. Jigsaw blades are fairly inexpensive, and so many different blades are available that making sure you use the correct one will not only ensure the best finish but also keep the costs to a minimum. Some older tools have an Allen key bolt that needs to be loosened in order to remove the blade. Modern tools generally have a quick release mechanism to make changing the blades quick and easy. On new power tools there is a quick release lever that you pull to drop the blade out. Older Dewalt tools take slightly longer as they have a black plastic button at the front that you lift up and turn anti-clockwise to loosen the blade. Simply reverse the process to put a blade back in. There are several different types of jigsaw blades available for various materials and speeds of cut. Choosing the right cutter for the job is essential in order to get the best finish and to prolong the life of your power tool. Click here for help choosing the best jigsaw blade for the job. 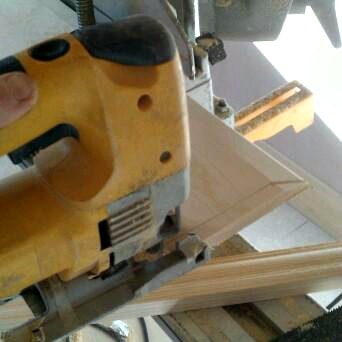 There are loads of different carpentry jobs I use my jigsaw for like skirting, kitchen fitting (including cutting worktops, sink/hob holes etc), scribing timber to irregular surfaces, cutting round pipes, roofing and more. Because the jigsaw uses a thin flexible blade it can often try to find the easiest route through the grain of the timber and deviate slightly. Even if you clamp a straight edge on this can still happen. If you are having trouble keeping it straight and the speed is adjustable, setting the speed higher but pushing the tool slower through the work-piece may help reduce this, along with ensuring you have the right jigsaw blade for the job (and that it's sharp!). It's one of the best tools for cutting laminate flooring with because the blades are relatively inexpensive and laminated materials always take the edge off really quickly, meaning you need to change them quite often. Never use a chopsaw on laminate flooring you'll almost instantly blunt the blade and then be burning the motor out soon after! A lot of tools offer an adjustable oscillating function. This means the blade moves forward on the upward stroke in order to cut more aggressively and then moves back out of the way a little on the downward stroke to reduce unnecessary blade wear. Use this function for cutting fast straight lines but not curved or intricate lines. Not a very useful function when using downward cutting blades either! Blades typically cut on the upward stroke causing tear-out in some materials. When that happens it makes it difficult to see the line you are trying to follow so sometimes I put masking tape on the work-piece before I mark it. You could score along the line with a Stanley knife or even better set out and cut the work-piece from the back/face down to. This isn't always practical and so downward cutting blades are available, which save the time of not having to set out on the back of the work piece. Doing that has a little more room for error and so you're much more likely to make a mistake. I normally buy both types of blade so I've got the option on site depending what i'm doing. It is possible on most saws to slide the base backward so you can get the blade closer to a wall for example. They also often allow the base to be tilted up to 45 degrees to cut mitres, though I very rarely use that function and tend to tilt my circular saw over in most situations. When cutting metal always use a slow speed and clamp the work-piece down. This helps ensure that the blade doesn't snag and cause bouncing, bending the work-piece. Use the comments box below to tell us what you have used a jigsaw for lately and if you have any tips of your own?